Weigela Florida are dense and compact growing bushy shrubs that bloom brilliant flowers and show off the elegant foliage. Wine and Rose Weigela is a very attractive deciduous flowering shrub, popular with landscape gardeners. It features beautiful round purple-hinted leaves and spectacular burgundy flowers, suitable for shrub borders and as hedges or screening. This plant brings life into the garden in spring and summer. Wine and Rose Weigela is an easy to grow flowering bush that looks exquisite and very attractive. It blooms burgundy red tubular flowers in masses during spring and summer. These large flower clusters attract lots of butterflies and hummingbirds. These blooms are backed by stunning and elegant purple-hinted foliage that gets darker as it matures. This is a low maintenance plant that demands less upkeep and thrives in dry conditions. Plant Wine and Rose in a sunny location or partial shade in a soil that is moist and well-drained. Its roots have to be kept cool, so add a layer of organic mulch made of composted bark to retain moisture in the soil beneath. 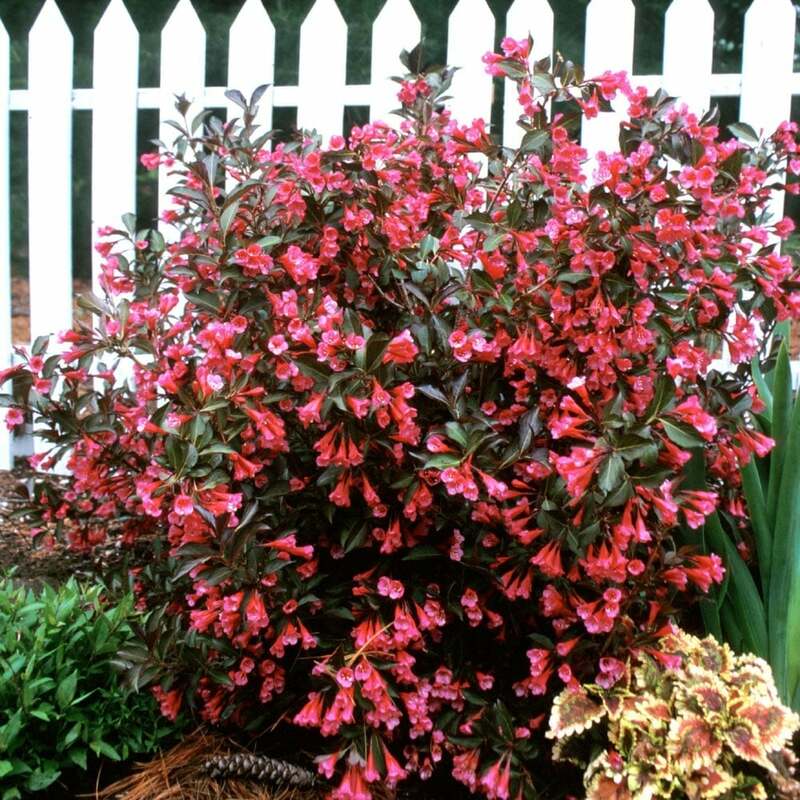 Wine and Rose Weigela will perform its best when it receives plenty of sunlight. Water the young plants regularly until their roots establish. This plant does not demand excessive pruning. Simply cut back old wood right after the blooming session. These are medium-sized deciduous shrubs suitable for hedging and screening. These are no ordinary bushes, they will light up dull corners in your garden in spring. Use them in groupings in mixed borders or as a single garden specimen.